When Hideaki Anno directed the Neon Genesis Evangelion TV series, he went against the grain by not creating yet another vanilla mecha fable. The first thing that stands out is the name of the show itself, which reveals its leaning towards religion on a thematic level. Neon Genesis Evangelion borrows from the Greek language and literally means 'Gospel of the New Genesis'. 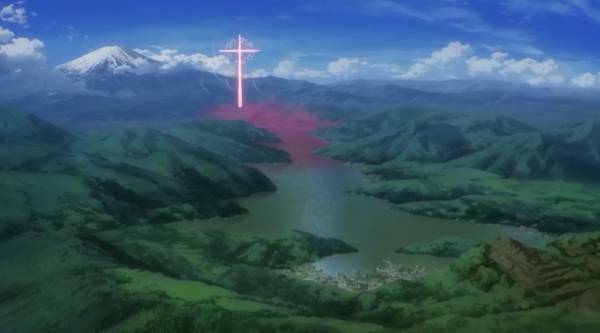 This gives the audience of Evangelion the perception that it's connected to the Christianity. To a certain degree, this is true. But Evangelion doesn't base its lore strictly on this, if we look at the symbolism we find that Kabbalah and Gnosticism also play an important role. Kabbalah is a science and methodology based on Jewish mysticism. It is not a religion but is often mistaken for one. Its primary purpose is to explain the relationship between the Creator and Creation. However, Kabbalah is incredibly dense subject and requires years of study in order to properly understand it. 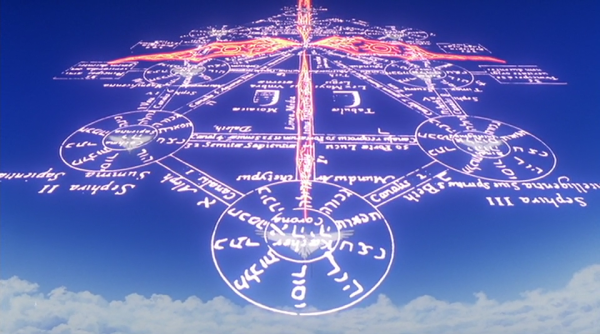 The Tree of Life of the Kabbalah is part of the symbolism that is prominent in the Evangelion series. On the Tree of Life, there are various spheres known as Sephirot and lines that connect these spheres to each other. Think of it as a system of how various aspects of our psyche relate to each other, the spiritual world and the Creator. During the Evangelion series, we see how Shinji Ikari struggles with his inner demons. He undergoes many trials and tribulations, overcoming some and failing miserably in others. Shinji represents the everyman who is in total darkness initially, but certain situations cajole him into taking actions that he is not happy to take. And yes, his old man, Gendo Ikari, is the main instigator. Naturally, these actions cause him much discomfort, physically and psychologically. He is in a very dejected state for much of the series, and would be in Malkuth within the Tree of Life. A critical transformation occurs for humanity when Kohzou Fuyutsuki announces that the Chamber of Guf is open, during the climatic finale of End of Evangelion. These will be the last moments for humanity as the AT-field between them is dissolved by Lilith's anti AT-field. The human instrumentality project is now a success because humans are united into a single existence, and thus evolve. As for Shinji, he is so broken and confused right through to the end. He envisions his deceased mother who assures him that everything will be alright. Gnosticism predates Christianity and is a religion that is focused profoundly on the spiritual realm. It's influenced by the various mystery religions that flourished in the ancient Greco-Roman and Middle Eastern world. Many valuable texts written by the Gnostics were lost due to the ravages of time but the Nag Hammadi Library was discovered in 1945. These papyrus codices contain much valuable information about the religion. A core belief of Gnosticism is in the fall of Sophia, and her involvement in the creation of the material world. 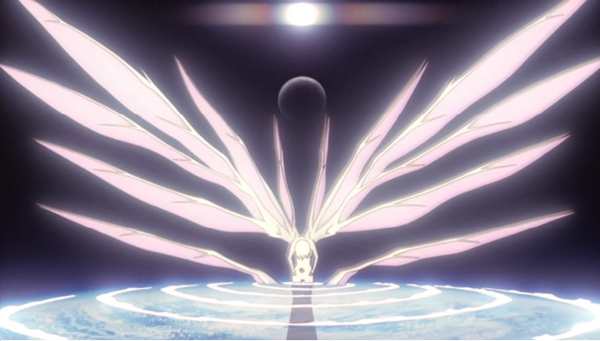 In Neon Genesis Evangelion, Rei Ayanami in her Lilith form acts as a metaphorical symbolism of Sophia. Lilith and Adam are the primordial mother and father figures of creation. That's why the Angels are hell-bent of retrieving them from mankind, and connecting with them in order to form a God-like consciousness. Some would expect Eve instead of Lilith to partner up with Adam. But according to Jewish mythology and Mesopotamian religion, Lilith was Adam's first wife and was made equal to Adam, and not from Adam. Unlike Eve who was created from one of Adam's ribs. The strongest symbolism in the entire Evangelion series is found in a rather peculiar place. 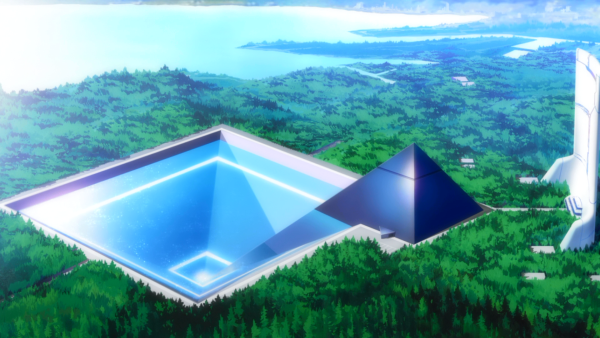 Nerv Headquarters, with its pyramidal architecture pretty much sums up what Evangelion is all about. In fact, there is not one but two pyramids in this subterranean GeoFront structure, built under Tokyo-3. Immediately apparent is the command center of Nerv Headquarters. It is the upright pyramid and is phallic in nature, thus representing the male principle. Gendo Ikari is Commander of Nerv and plays a very patriarchal role, while making decisions that affect the very existence of humanity. His office is located near the top of the pyramid structure, in which the Tree of Life appears on both the ceiling and floor. The second pyramid is an inverse one; this is where the water is contained. From a bird's eye view, the Nerv HQ resembles female genitalia, and is obvious symbolism of the female principle. In the grand scheme of things, this makes sense. After all, the story of Evangelion culminates as Adam and Lilith come into contact with each other, representing the male and female principle respectively. For Religion, or Against Religion? 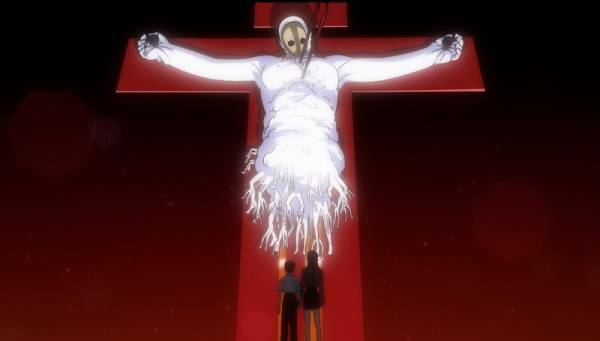 Evangelion is controversial because of how religion and symbolism is used throughout the series. Some folks think that it promotes Christianity while others assume that it's trying to make a mockery of the religion. At its core, Evangelion still remains a science fiction mecha show. There's no nefarious pro or anti-religious machinations going on here. The symbolism is just there to spice things up and differentiate it from other mecha anime of the era. Gainax should be commended for creating such a multi-layered and deep universe which cleverly integrates various religious and spiritual ideologies. Many fans prefer to keep discussions about anime and religion separate. When they do, they miss out on a chance to understand both anime and various religions on a deeper level.